Controlled-release (CRF) and slow-release (SRF) fertilizers belong to the larger group of enhanced-efficiency fertilizers, which also include nitrogen stabilizers, nitrification inhibitors, urease inhibitors, and stabilized fertilizers. Controlledrelease fertilizers are generally coated products. Slow-release fertilizers are noncoated products in which the nutrient release is uncontrolled but slow; these are mainly urea-aldehyde reaction products but also include other slowly soluble products such as fertilizer spikes and ion exchange resin fertilizers. Whereas the bulk of the market belongs to the stabilizers and inhibitors categories, CRFs and SRFs are used in much smaller volumes and therefore might be considered specialties. Although controlled- and slow-release fertilizers have been shown to have efficacy, their use is still relatively limited as they are much more expensive than the commercial fertilizers in the market. For this reason, they are used primarily in niche markets like golf courses, landscaping, and nurseries and greenhouses. The global market is expected to grow at about 5–6% per year during the forecast years (excluding commodity agriculture), helped by increases in efficiency, reduced quantities of waste due to runoff, and also by increases in food demand by the growing population, especially among the third-world nations that are shifting to a more protein-based diet and away from traditional carbohydrate-based diets. Controlled- and slow-release fertilizers have become one of the fastest-growing fertilizers in China in the last five years, fueled by the rapid growth of the Chinese economy and the need to improve fertilizer efficiency, increase crop yield, and reduce the impact of fertilizers on the environment. As a result, China has become the major market for CRFs and SRFs, for both the commodity agriculture and agricultural crop markets. The United States has also been a significant market for CRFs and SRFs. Nonagricultural applications are the leading demand segment in the United States, followed by the rapidly rising agricultural commodity and agricultural crop markets. Smaller volumes of CRFs and SRFs are produced and consumed in Western Europe and Japan, as well as in other regions such as Canada, Central and Eastern Europe, the Middle East, and Africa. CRFs and SRFs are an efficient alternative to conventional fertilizers because of their environmentally friendly, resourcesaving, and labor-saving characteristics. However, because of their high price relative to conventional fertilizers, their use is still limited primarily to ornamental, horticultural, and turf applications. As larger production scales of these materials are achieved, the costs will continue to decline from current values, making them more attractive for commodity/openfield/broad-acre crops such as corn, wheat, and potatoes. Another factor that will drive CRF and SRF demand in the future is the regulations and penalties that encourage growers to minimize fertilizer runoff in water streams. 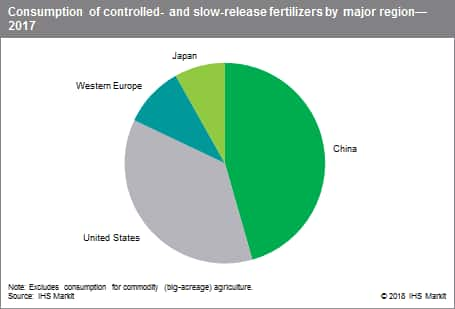 The trend toward increasing use of coated controlled-release fertilizers is expected to continue. Coated fertilizers, particularly polymer-coated products, have been the fastest-growing segment of the CRF and SRF market, and will continue to grow at a faster rate than other CRF and SRF types. The advent of less-expensive polymer coating technology has led to increased consumption of CRFs in commodity (big-acreage) agriculture, especially in North America (the United States and Canada) and China. Overall global demand for CRFs and SRFs will continue to increase at around 8% annually during 2017–22 for all applications, including horticultural and turf and agricultural crop applications, and commodity (big-acreage) agricultural applications in North America and China.